(08-22-2018 04:17 AM)CliftonAve Wrote: ^^ I could tee your post up with facts, but I am not going to feed you. Thanks CliftonAve. Couldn't agree more. (08-22-2018 03:54 AM)Not Duane Wrote: This is reflected in UC's lifetime FB record of .509, which is in the bottom 10% of all division I programs. This statement seemed patently absurd based on logic, but I checked just to verify. Sure enough... That would be in the bottom 34%...not the bottom 10%. Missing the mark again Not Duane. After much reflection, I would like to apologize to the University of Cincinnati football program, its coaches, players, support staff and most importantly to the faithful of Bearcat Nation. In hindsight, I've spent too much time writing unfair, negative articles from the comfort of my basement office. Most recently, traveling to Camp Higher Ground enabled me to personally witness the effort, enthusiasm, determination and integrity of the football team that took me by surprise. This has given me pause to self-reflect and see a whole new light on this rising program. Moving forward, I give the City of Cincinnati my word and pen that I will fairly and objectively cover the football program with as much vigor and passion that I can muster. I see now that I can help, and not hinder, our fine university and the football program advance to bigger and better things this season and beyond in my own, small way. I especially want to thank Chad Brendel and Dan Hoard who have shown me how true professionals work and cover their beloved Cats. I look forward to some exciting brand of football and to a successful season. I'm a simple man. I see another troll post bashing UC with nonsense, I neg-rep and move on. Not Duane posts a couple violations that are pre-1980's? How is that even remotely connected to today's program? Frankly, those violations are mainly secondary violations in today's world. You oversimplify the coaching discussion. Coaches have had success at UC. There are many variable in play other than to say UC will always be what you call a "training ground" with limited success. Not Duane you continue to miss the mark. LMAO ... Paully D has too much hubris to pen something like that. Why does he always look like he just came home from a 3 day bender in Vegas? This puts us at 69th out of 106 all-time winning percentages when you correct for programs with identical records. I bet that would actually pull in certain recruits. I wonder if he even notices? "I'm starting to think some folks in Cincinnati care about what the football team is doing. I mean, they still haven't really played anybody and the Bengals are drawing big interest right now. Still, I think I may try to watch a quarter or two of the Tulane game next week from my basement office to gauge the level of fan interest. I may even write something about it for my weekly sports summary." Where ya at Paul [Dik] Daugherty? Have you come out of your basement yet to attend a Bearcats game? What's the matter? Not enough excitement yet? Not enough people care? I gorsh dern guarantee you that if the Cats were 3-3 or worse you'd be all over it like a fly on shat. I gave up on the local media. I subscribe to the Athletic and read my UC stuff there. Don't even read the Enquirer at all any more. This is basically something a 12 year old Xavier fan would say . (10-09-2018 12:23 PM)mlb Wrote: I gave up on the local media. I subscribe to the Athletic and read my UC stuff there. Don't even read the Enquirer at all any more. era. (ok secretly I read the Obits). Local TV sports is pathetic..
What a trash publication. The sooner they go under, the better. UC must be doing something right. 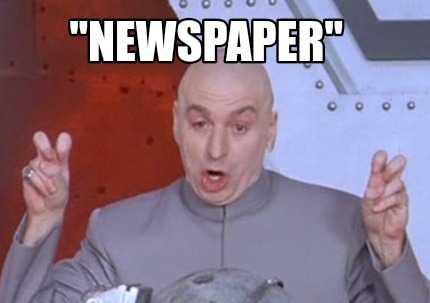 The local media is back trying to denigrate the University. And his angle would be "remember when UC was good at football...???" Then he'd be like "look at me! look at me! I'm covering UC!!" (08-17-2018 10:49 AM)CliftonAve Wrote: Pfft.. even if we beat those teams history has shown we will still empty seats in mid to late season. The 2011 team went 11-2 and we had about 25,000 people on a sunny, 68 degree day game against UConn on Senior Day. So how can this ever change - especially after the renovations/upgrades to Nippert? 1. Start winning again... a lot...consistently. 2. Playing meaningful games in November; specifically, conference championships on the line. 3. Playing more meaningful games in a P5 conference. If an Oklahoma or Clemson was visiting Nippert in November...heck even a Kansas State or Duke, and UC was in the hunt: instant sellout. We've come a long way but I agree with CliftonAve, late season attendance is a real downer after witnessing our early season atmosphere for sellouts in the not too distant past. Solid progress. But we're not yet where we want/need to be. I think the Conference is being MUCH smarter about this specific point than the Big East ever was. If you notice, they've really been smart about their scheduling of premier teams in basketball, and they've gotten quite a bit right about the football schedules too with regard to getting ranked games late for primetime TV.